The first page you see here is the key. This is just an overview of the different symbols I'll be using throughout the journal. I decorated with these handdrawn flowers and my Faber Castell PITT artist brush pen in grey. I'll link all the supplies I used down below. Next up is my yearly overview. I made a 12 month calendar on one page and glued a piece of watercolor paper on the other page with the quote “get out of your own way”. For this I used my little Windsor&Newton watercolor travel set and Finetec Pearl watercolor palette. The first of my collections is a YouTube spread with a page to track the growth on my channel and a page for my video ideas. I continued the flowery theme from the key page to have some continuity throughout the journal. I also added the same purple watercolor details from before. The brush-looking headers I did on several of the pages is done by using a fineliner and then thickening all downward strokes to give the illusion of a brush pen. 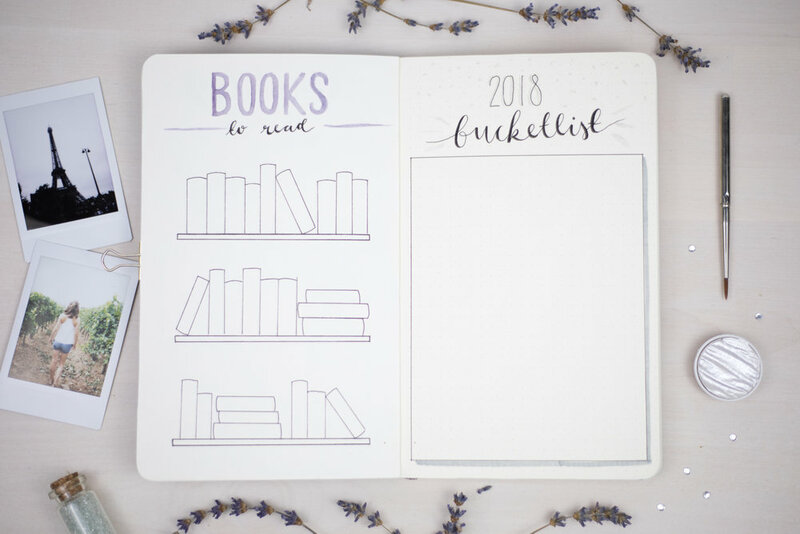 The next pages are my savings tracker and wishlist for 2018. I drew four "mason jars" and labeled them respectively Travel, Apartment, Youtube and Total. This way I can keep track of which cause I set money aside for, and motivate myself at the same time. On the opposite side I made a list of wishes which are on the more expensive side - one that I need to save up for. This way I have a clear goal for where the money I'm saving up is going to, and I won't feel tempted to use it on smaller things that aren't important. These two pages are my "books to read" and 2018 bucket list. All the titles of the books I plan on reading throughout the year will go on the spines of the books I've drawn above, and hopefully by the end of the year I'll have a somewhat full bookshelf. As for the bucketlist I chose not to call it "goals for 2018" because I didn't want to stress about fulfulling them. I'll just be writing things that I think might be fun and cool to do over the course of the year. I started off my monthly spread with a watercolor page. On the other page I did a monthly overview, where I wrote each day vertically. Here's where I'll write the most important things for each day. Before starting my weekly spreads I made an expense tracker to write down all of my expenses for January.